This interesting name, with variant spellings Harlowe and Arlow, is of Anglo-Saxon origin, and is locational from any of the various places thus called. One in the West Riding of Yorkshire gets it's name from the Olde English pre 7th Century "hoer", rock or pile of stones, plus "hlaw", a hill. 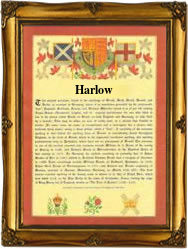 Harlow in Essex and Northumberland, recorded respectively as "Herlawe" circa 1043 (Anglo-Saxon Wills), and as "Hirlawe" in the 1242 Fine Court Rolls of Northumberland, have as their first element the Olde English pre 7th Century "here", an army or host, plus "hlaw", as above; hence, "the mound of the people". The reference here is probably to an ancient meeting place of the hundred. Locational surnames, such as this, were usually acquired by a local landowner, or by the lord of the manor, and especially by those former inhabitants of a place who had moved to another area, usually in search of work, and were thereafter best identified by the name of their birthplace. One Richard de Herlawe was recorded in the 1273 Hundred Rolls of Essex, and Walter de Harlow was recorded in the 1327 Subsidy Rolls of Yorkshire. Anthony Harlow, registered on a list of the living in Virginia on February 16th 1623, was an early settler in the New World Colonies. The first recorded spelling of the family name is shown to be that of Osbern de Herlaye, which was dated circa 1121, in "Feudal Documents of Bury St. Edmunds", Suffolk, during the reign of King Henry 1, known as "The Lion of Justice", 1100 - 1135. Surnames became necessary when governments introduced personal taxation. In England this was known as Poll Tax. Throughout the centuries, surnames in every country have continued to "develop" often leading to astonishing variants of the original spelling.